Next Auction Monday Dec 26. A fresh blanket of snow put me in the holiday mood. So off I went to find a worthy subject. Four wheel drive and good snow tires are a necessity in my line of work. If home is where the heart is, I hope yours is filled with peace and joy. Congratulations to our winners for December! Gosh, I love this Peter. 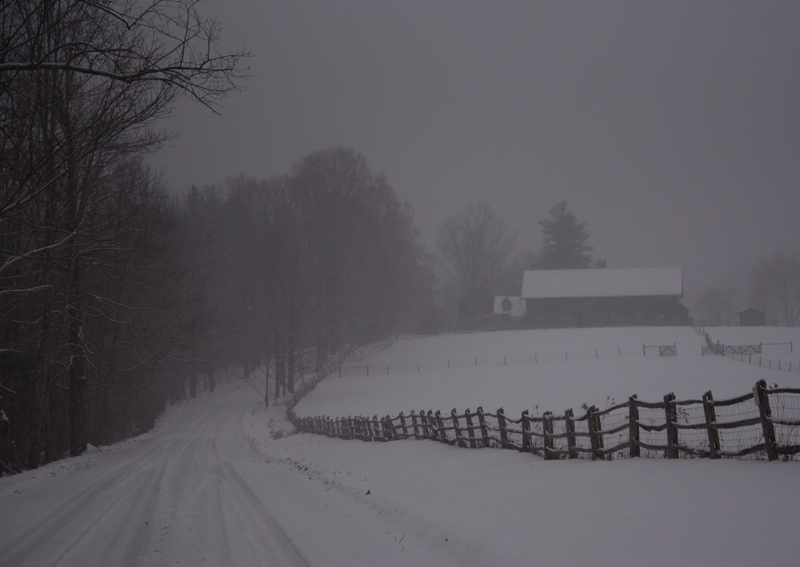 It reminds be of the countryside where my mother was born in rural Virginia. Whoever gets it will be blessed. I wish I could but not able. Love it. Oh, how nice! Soft lilac-grey wintercolors. Frosted snow and twilight…. And you love to stay at home. Merry Christmas and a happy new year! I do love home, thank you Doris! Beautiful! …… With a sense and of peacefulness and joy. Thank you! 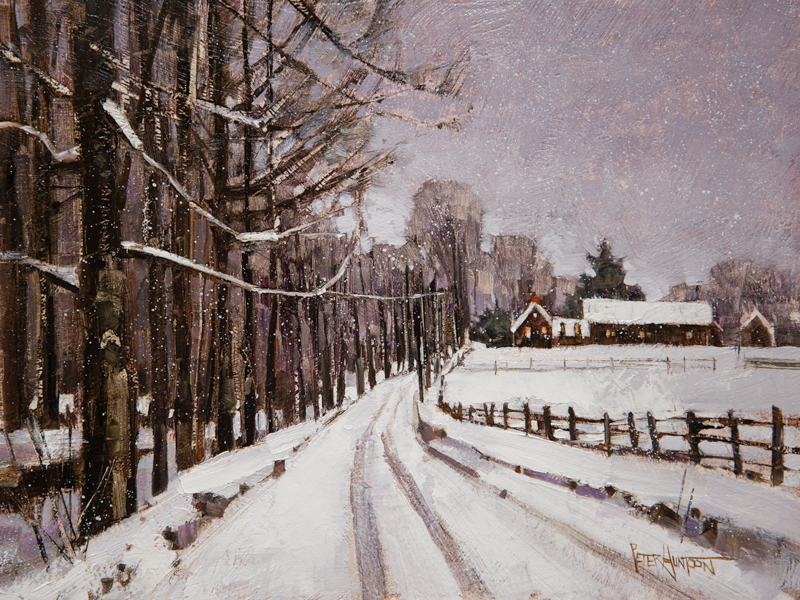 Peter- a beautiful winter scene. This makes me consider visiting my sister and brother in law in Dorset this winter. Your paintings have been a wonderful addition to our Florida home. Merry Christmas and a happy new year! Thank you Dave, I’ll look forward to seeing you guys when you visit again! This is beautiful! the muted colors are not your usual palette, but I love this one. Makes me think of Frost’s “Stopping by the Woods on a Snowy Evening”. Happy Holidays to you! Merry Christmas & Happy New Year Peter! I look forward to receiving your paintings and the glimpse into your heart as a person and an artist. Wishing YOU a healthy, peaceful and prosperous holiday season! Merry Christmas Peter and a Happy and healthy New Year! Please do keep the Art work coming it adds so much culture to the area…..So glad to have you as my friend of Christmas past……….and present…….Ricksta. Ah, the cozy setting of the perfect place to call home! Thank you for brightening my day Peter. Ah, the perfect cozy setting to call home in our magnificent Green Mountain state. Thank you for brightening up my day Peter. Hi Peter, Home for the Holidays is wonderful. I would love it if you did note cards or Christmas cards. This one would be my choice! When the snow is falling values and contrasts are diminished, but a richness remains. Delicate color enhances the grays, and a sense of peace and stillness descends. A soft glow of warm light from distant windows welcomes each of us home, even if only possible in our minds and hearts. Merry Christmas, Peter. So glad I got to meet you this past summer in Waitsfield. I’ll try to send a little warm Florida sunshine your way! Thank you, Doris, for your kind words. Merry Christmas, and God bless! 2017 brings retirement to my boyhood home, the lovely Cotswold Hills of Oxfordshire, England. The nearest place on earth I know that compares to the beauty that is our Vermont home. I’ve placed a bid on the “Home for the Holidays” painting, Peter. It will take pride of place in my Cotswold home if my acquisition succeeds. A fond reminder of the many wonderful years I have spent here in Vermont. Thank you Thomas, I have heard of many great artists being attracted to that area. It looks wonderful and maybe I will visit one day. Sorry you did not “win” this one, but hopefully there will be another that you will fall in love with. Beautiful painting ; perfect Christmas gift . WOW!!!! What a great way to end the year, Peter. Congratulations on all your auction sales. THANK YOU for sharing your wonderful art with all of us along with your beautiful heart & soul. You deserve every benefit that you reap 🙂 Merry Christmas and continuous success in the New Year! Thanks so much Mary Fran, much appreciated. As a fellow artist, you know very well the real work it takes to consistently produce your best work. Beautiful. Makes me homesick for the big snowstorms, the winter white of early youth! Thank you for sharing your gift with all of us. Peter, your painting reminds me of a vintage sepia photograph, in its coloring and its perspective. Thank you once again for sharing your heart and eye. Your pictures make feel that I am back in Vermont. Thank you so much.